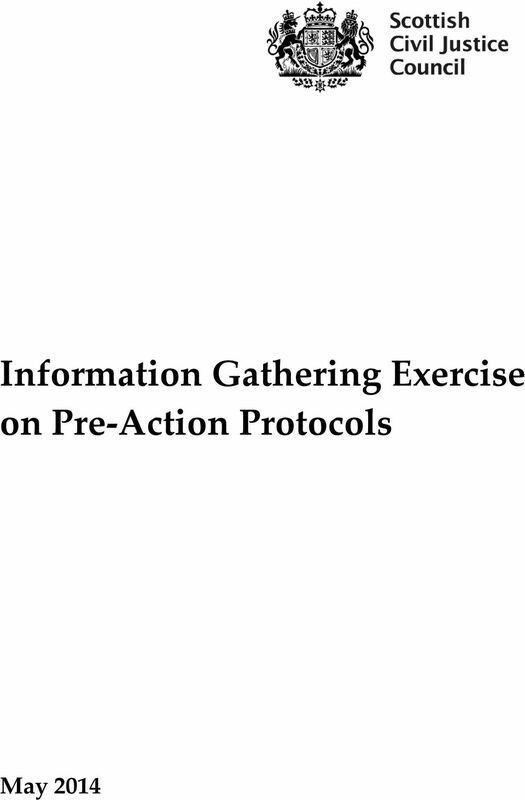 Download "Information Gathering Exercise on Pre-Action Protocols"
2 INFORMATION GATHERING EXERCISE QUESTIONNAIRE 1. 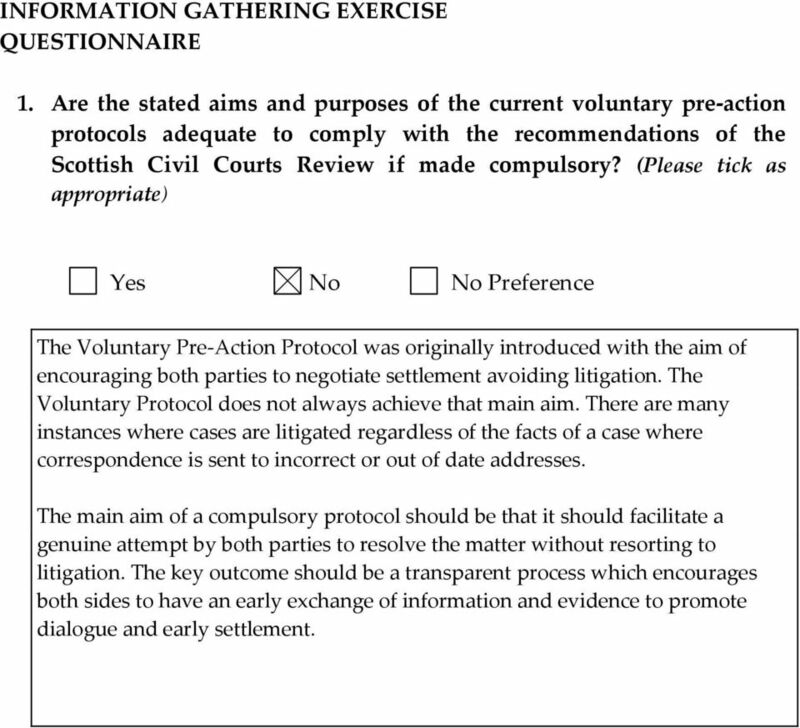 Are the stated aims and purposes of the current voluntary pre-action protocols adequate to comply with the recommendations of the Scottish Civil Courts Review if made compulsory? (Please tick as appropriate) The Voluntary Pre-Action Protocol was originally introduced with the aim of encouraging both parties to negotiate settlement avoiding litigation. The Voluntary Protocol does not always achieve that main aim. There are many instances where cases are litigated regardless of the facts of a case where correspondence is sent to incorrect or out of date addresses. The main aim of a compulsory protocol should be that it should facilitate a genuine attempt by both parties to resolve the matter without resorting to litigation. The key outcome should be a transparent process which encourages both sides to have an early exchange of information and evidence to promote dialogue and early settlement. 3 2. If not, what changes, if any, should be made to the voluntary preaction protocols to make them more effective in achieving their stated aims and purposes? To enable the Compulsory Pre Action Protocol to meet the aim of settling cases without the need for litigation a balance needs to be struck between remunerating the Pursuer s Solicitor but at the same time reducing the potential conflict of interest that is awarding expenses directly linked to the damages as a percentage. Expenses should be proportionate to the case at hand. In the present situation, particularly in low value claims expenses are likely to exceed damages. For example a whiplash case settled at 1600 would provide fees of 1210 plus VAT and the costs of a medical report. In England and Wales the same case would attract a fee of 500 plus VAT. If any Compulsory Pre Action Protocol is to work then there should be sanctions on any party who fails to comply with the Protocol. 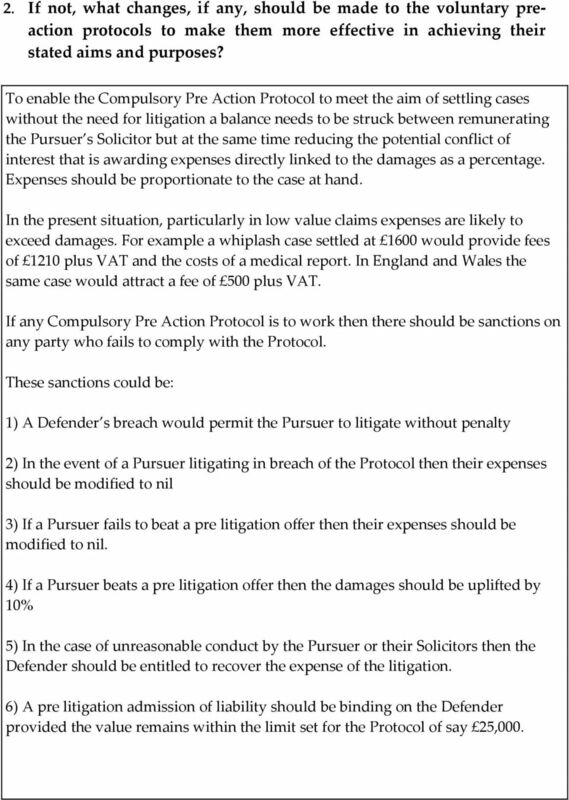 These sanctions could be: 1) A Defender s breach would permit the Pursuer to litigate without penalty 2) In the event of a Pursuer litigating in breach of the Protocol then their expenses should be modified to nil 3) If a Pursuer fails to beat a pre litigation offer then their expenses should be modified to nil. 4) If a Pursuer beats a pre litigation offer then the damages should be uplifted by 10% 5) In the case of unreasonable conduct by the Pursuer or their Solicitors then the Defender should be entitled to recover the expense of the litigation. 6) A pre litigation admission of liability should be binding on the Defender provided the value remains within the limit set for the Protocol of say 25,000. 4 3. Are changes required to ensure that pre-action protocols better reflect the needs of party litigants? 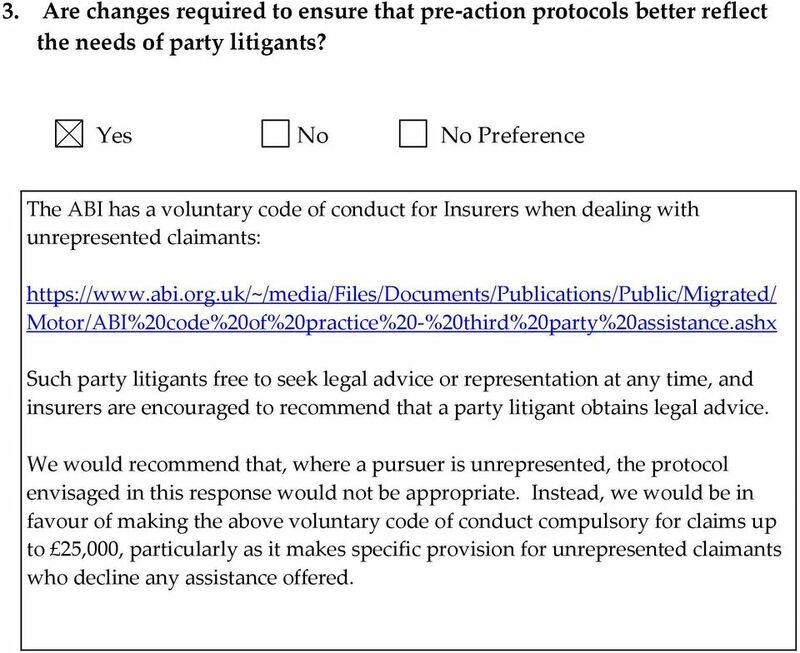 The ABI has a voluntary code of conduct for Insurers when dealing with unrepresented claimants: Motor/ABI%20code%20of%20practice%20-%20third%20party%20assistance.ashx Such party litigants free to seek legal advice or representation at any time, and insurers are encouraged to recommend that a party litigant obtains legal advice. We would recommend that, where a pursuer is unrepresented, the protocol envisaged in this response would not be appropriate. Instead, we would be in favour of making the above voluntary code of conduct compulsory for claims up to 25,000, particularly as it makes specific provision for unrepresented claimants who decline any assistance offered. 5 4. 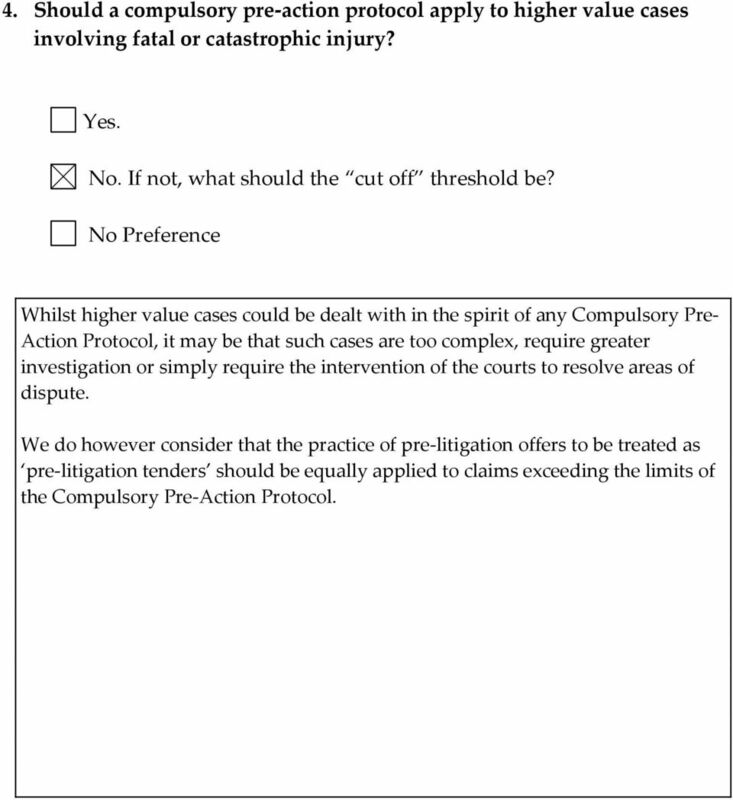 Should a compulsory pre-action protocol apply to higher value cases involving fatal or catastrophic injury? Yes. No. If not, what should the cut off threshold be? No Preference Whilst higher value cases could be dealt with in the spirit of any Compulsory Pre- Action Protocol, it may be that such cases are too complex, require greater investigation or simply require the intervention of the courts to resolve areas of dispute. We do however consider that the practice of pre-litigation offers to be treated as pre-litigation tenders should be equally applied to claims exceeding the limits of the Compulsory Pre-Action Protocol. 6 5. Is it necessary to consider any additional protocols, or maintain exceptions, for specific types of injury or disease claim, for example, mesothelioma? 7 Fundamental differences exist between a personal injury claim and industrial disease claim in particular those involving long tail exposures. It is essential that a separate disease protocol is retained for these claims. In the majority of cases a longer period of time is required to investigate liability as issues relating to apportionment, causation and limitation will all need to be addressed. The involvement of additional defendants as well as co insurers is common place and thus greater time is required in order to identify and liaise with all parties involved. It is not necessary to have individual protocols for different disease types the exception being mesothelioma as it is essential for the benefit of the sufferer and their families to reduce the speed of settlement. Parties should be encouraged to adhere to the timetable set, with some flexibility being proposed similar to the professional negligence protocol. Allianz already participate in a voluntary arrangement in relation to mesothelioma claims. This provides a shorter timetable with early disclosure of evidence in particularly the claimant s witness statement, allowing for early investigation whilst reducing unnecessary delay. 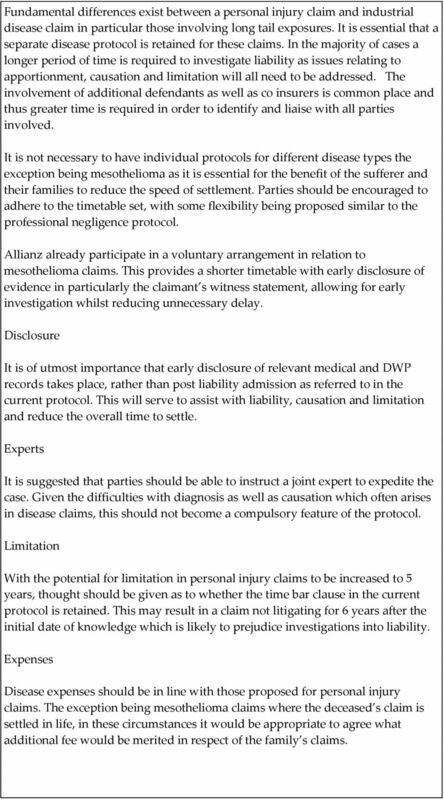 Disclosure It is of utmost importance that early disclosure of relevant medical and DWP records takes place, rather than post liability admission as referred to in the current protocol. This will serve to assist with liability, causation and limitation and reduce the overall time to settle. Experts It is suggested that parties should be able to instruct a joint expert to expedite the case. Given the difficulties with diagnosis as well as causation which often arises in disease claims, this should not become a compulsory feature of the protocol. Limitation With the potential for limitation in personal injury claims to be increased to 5 years, thought should be given as to whether the time bar clause in the current protocol is retained. This may result in a claim not litigating for 6 years after the initial date of knowledge which is likely to prejudice investigations into liability. Expenses Disease expenses should be in line with those proposed for personal injury claims. The exception being mesothelioma claims where the deceased s claim is settled in life, in these circumstances it would be appropriate to agree what additional fee would be merited in respect of the family s claims. 9 This is outwith our area of expertise 8. If you answered yes to Question 7, what should the key features be? N/A 9. 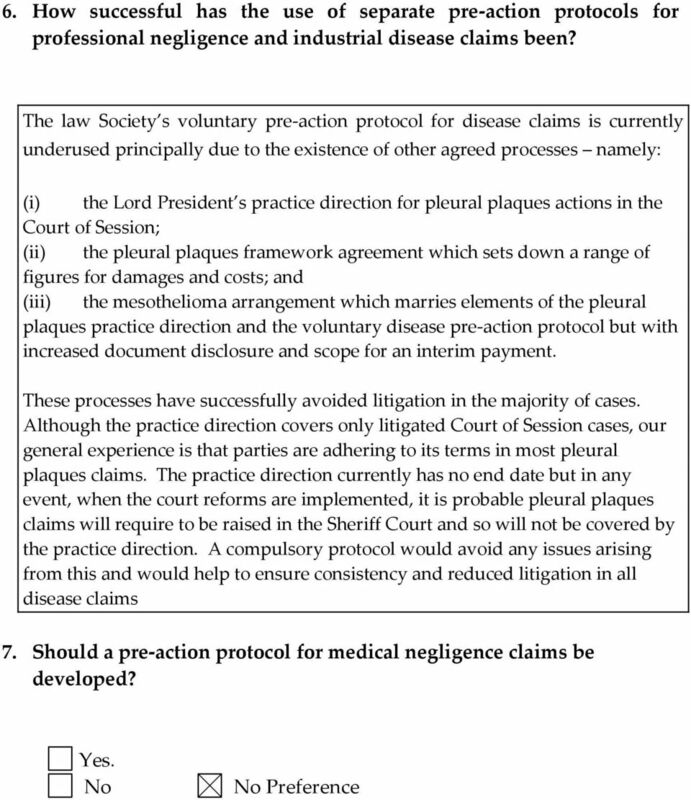 Are there are any issues relating to the operation of the Pre-action Protocol for the Resolution of Clinical Disputes in England and Wales that should be taken into account? 10 This is outwith our area of expertise. 10. Should a new pre-action protocol regime be introduced in advance of the creation of the specialist Personal Injury Court? Please give reasons for your answer. We view the introduction of a Compulsory Pre-Action Protocol as being first and foremost for the benefit of the injured claimant. As such, any progress we make in this area to streamline, simplify and enhance the process should be implemented at the earliest available opportunity. This is required to dovetail into the Court Reform Bill proposals to assist in the aim of freeing up court resource. A Compulsory Pre-Action Protocol in the format we ve envisaged would also be very important to successful implementation of Sheriff Principal Taylor s recommendations in his Cost and Funding of Civil Litigation Review. 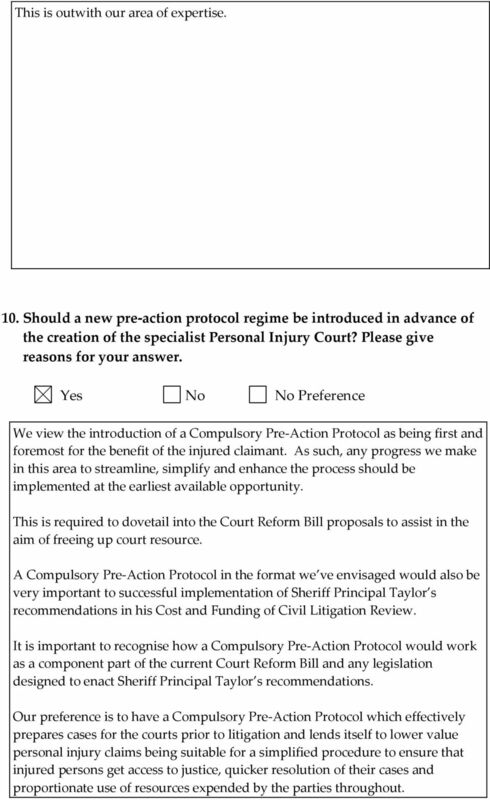 It is important to recognise how a Compulsory Pre-Action Protocol would work as a component part of the current Court Reform Bill and any legislation designed to enact Sheriff Principal Taylor s recommendations. Our preference is to have a Compulsory Pre-Action Protocol which effectively prepares cases for the courts prior to litigation and lends itself to lower value personal injury claims being suitable for a simplified procedure to ensure that injured persons get access to justice, quicker resolution of their cases and proportionate use of resources expended by the parties throughout. 11 11. Are you or your organisation aware of variations in awards of expenses where the pre-action protocol has not been adhered to? We are aware of a very wide range of results in the courts on the issue of expenses. This is perhaps not surprising in light of the fact that expenses are always at the sole discretion of the sheriff who hears the submissions. Some insurers (and self-insuring bodies) who have not wanted to use the Voluntary Pre-Action Protocol ( VPAP ) have been penalised for not following it (even when it is supposed to be voluntary). 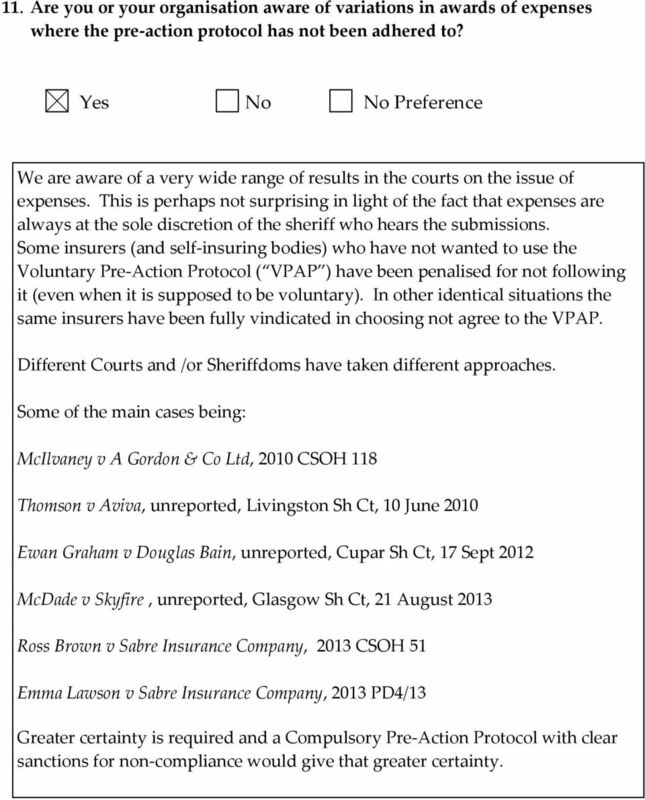 In other identical situations the same insurers have been fully vindicated in choosing not agree to the VPAP. Different Courts and /or Sheriffdoms have taken different approaches. Some of the main cases being: McIlvaney v A Gordon & Co Ltd, 2010 CSOH 118 Thomson v Aviva, unreported, Livingston Sh Ct, 10 June 2010 Ewan Graham v Douglas Bain, unreported, Cupar Sh Ct, 17 Sept 2012 McDade v Skyfire, unreported, Glasgow Sh Ct, 21 August 2013 Ross Brown v Sabre Insurance Company, 2013 CSOH 51 Emma Lawson v Sabre Insurance Company, 2013 PD4/13 Greater certainty is required and a Compulsory Pre-Action Protocol with clear sanctions for non-compliance would give that greater certainty. Action against Medical Accidents response to the Consultation on proposals to reform Fatal Accident Inquiries legislation Introduction 1. Action against Medical Accidents (AvMA) was established in 1982. What is the problem under consideration? Why is government intervention necessary? Partial regulatory impact assessment on a proposed bill to reverse House of Lords judgment in Johnston v NEI International Combustion Ltd The ABI s Response to the Scottish Government s Consultation 1.